If you ask what ‘The Troubles’ refers to, it is likely that not many people would have heard of it or know what it relates to. But the cinematic debut from Top Boy director Yann Demange highlights this historical conflict in Northern Ireland, which lasted nearly 30 years. 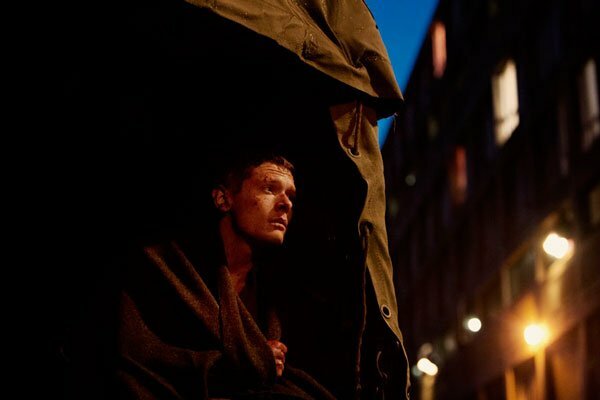 ’71 sees young soldier Gary (Jack O’Connell), who is despatched to Belfast with his regiment. When a riot unexpected arises, he is accidentally abandoned by his comrades, leaving him stranded in a dangerous estate. It soon becomes a race against time for him to get to safety before the IRA track him down. Gregory Burke’s script doesn’t have a chance to make an impact and there is very little background information about the conflict itself, which is strange for a historical film as it is regarded as a key point in the struggle between Irish and English relations. But that is really where the negatives stop. In ’71, DeMange creates a well-paced, gripping feature. The film eases into the brutality experienced by its protagonist, before delving into the deep end when Gary’s squadron flusters from being underprepared. As the situation worsens, DeMange doesn’t scrimp on the violence and influences from his previous work, there is a grittiness that reflects the harsh reality of not only Gary’s dilemma, but also the severity of the conflict in Belfast. As Gary’s struggle progresses from bad to worse, the tension increases to the point where fingernails are well and truly chewed off. Surely the man of the moment, O’Connell plays Gary with the basic instinct to survive without showing off. Proving that he can do violent, action-oriented roles from Eden Lake and 300: Rise of an Empire, he has surely grown up since the days of Skins. Overall, the lack of context doesn’t lessen the tension and watchability of Demange’s feature debut. With a stellar performance from O’Connell, ’71 will be the quiet star of this year’s 58th London Film Festival. This was one of the best films of the NYFF and I would give it the same rating. Yann Demange emerges as a feature filmmaker of world class status with this effort. Really? Either you’re showing your age, or I’m showing mine! I have just conducted an ad-hoc and unscientific poll of my workmates, and you are absolutely right: the only people under 30 who knew what the Troubles were hailed from Ireland. Typo: I meant to say I am NOW boned up a bit on Jack O’Connell.